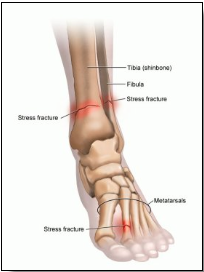 Treatment for a metatarsal stress fractures usually consists of rest, elevation, and ice initially. Sometimes a compression bandage is applied to help reduce the swelling. Frequently a post-operative type shoe or cam-walker is used to prevent you from pushing off the ball of your foot, thus eliminating any additional stress while the bone is healing. Occasionally a short leg walking cast may be applied for a short period of time. Typical healing times range from 4 to 8 weeks. After the fracture is healed, special attention should be paid to using a well-padded insole or a functional orthotic in the shoes to reduce the stress in this area. For those who may have osteoporosis, bone densitometry testing should be done, and appropriate treatment initiated to prevent further weakening of the bones.